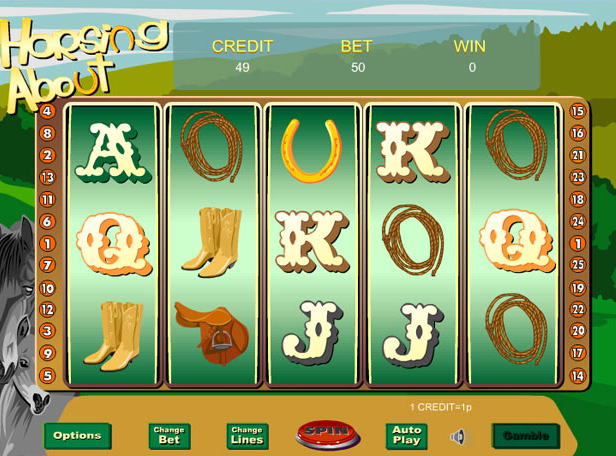 Horse about during this 5 reel adventure slots game and befriend the stallions and studs in this cowboy themed online slot game that will see you win a huge jackpot. Join today! Founded in 1997, Eyecon burst onto the scene with the wildly popular game, Gore. The millions of downloads provided their base to begin building an online casino system and gambling games. Their first ever slot, Temple of Isis, released in 2003, remains a firm favourite with online gamers today. Fluffy Favourites, released in 2006 is their most successful game to date and remains one of the best slot games available. Click now if you'd like to learn more. Horsing About the title says it all, however, there is little horsing about with this horse loving slot from Eyecon. The graphics and game style do look a little outdated by today's standards in online slots, but don't be fooled as this slot offers some good bonus features and playability that boast potential wins of fifteen free spins and chances to triple your wins! So, set your bets, anything from 0.01 to 0.10 and saddle up! With a backdrop of open fields beneath a blue sky, Horsing About immediately sets the tone of a great day in the country horse back riding. There are five reels set in a simply decorated panel and twenty seven bet lines to play. All the reel symbols are in theme and include playing card values from a Jack to an Ace. These are low payers and the most lucrative payers are the Ace and the King symbols and landing five of any on the reels wins you 250 coins. Other symbols are two rope lasso's. A saddle, a horse and riding boots, a grey horse and brown horse. A cowboy hat is a wild and subs for all other symbols bar the scatters and a lucky horseshoe is the scatter. Land three or more of the golden horseshoes anywhere on the reels and you will trigger the Free Spins Feature giving you a generous fifteen free games! During the free spin play any wins are tripled and landing three more horse shoes will re-trigger the feature, adding more free spins to your total. Who says horseshoes aren't lucky?! Should you click five cowboy hats into place on a winning pay line you will snag a huge win of 9,500 coins! Don't dismount just yet. We also have a gamble feature. You can choose to gamble any win and clicking the option takes you to a game of chance. This is a choice of good and bad. Good, you double your winnings, bad choice, you loose it all. Play wise, a win is a win and not to be gambled with... Unless you feel extra lucky of course. Along the panel, beneath the reels, you will find buttons offers bet and line settings and game settings. The spin button is large, red disc and you will also see an auto spin button. The sound effects consist of a few jingles and bells very reminiscent of older slot machines. If you love horses then Horsing About is the ideal slot to enjoy. With plenty to play for, good features and some generous prizes, you will want to saddle up more often! Learn more about mobile slots. Although a little outdated in appearance and play, it has Eyecon's excellent production to thank for its enduring charm and Easy playability. Anyone into horses will love it and with good bonus features and the potential of some generous prize wins, it should attract a loyal audience and enjoy lots of return play. See more popular online slot games in easyslots.com.